I received 3 T-shirts from Better Than Pants to try and review. I personally love Tee's. They are comfortable, You can wear them with almost anything, and you can wear them almost anywhere! Great for fall, spring, and summer weather. They come in different shapes, sizes, logos, colors, and in this case designs. There has been a long line of battles of what hair color prefrences are better. Blonde, Brunette, redheads.. 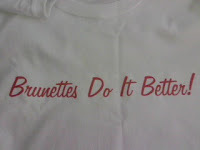 I'm a brunette so naturally I'm on team Brunette so when I seen this Tshirt I wanted it! Now I can strut my stuff every where I go and support team Brunette. I know the blondes won't like it very much but they can get over it. The Tshirt is pure white with just the pink letters saying "Brunettes Do It Better! written across the bust area. 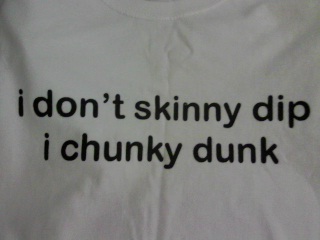 The Tshirt is 100% cotton, Machine wash warm inside out, with like colors, Only non- chlorine bleach. Tumble dry medium. Do not iron. Do not dry clean. The shirt is a relaxed fit and is soft. I put this Tshirt through the washer/dryer/iron test and there was no shreading of the design. It came out perfect. 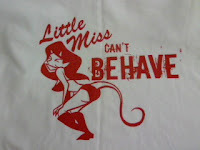 Another one of my favorites is the "Little Miss Can't Behave" Tshirt..For many reasons.. One I love devil designs when it comes to clothing. This one has a female devil (LOVE) and the text little miss can't behave which I really liked that logo. It fit's me oh..so..well. The devil girl design is a more retro devil girl and I love retro graphic designs so this is like a dream shirt. I love it! 100% cotton, Machine wash warm inside out, with like colors, Only non- chlorine bleach. Tumble dry medium. Do not iron. Do not dry clean. The shirt is a relaxed fit and is soft. I put this Tshirt through the washer/dryer/iron test and there was no shreading of the design. It came out perfect. 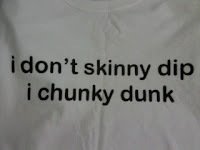 When I seen the "I don't skinny dip I chunky dunk" Tshirt it cracked me up! and I knew I had to have it! Right before I seen this one on Better Than Pants I had actually posted this on my facebook status! So when I seen it I knew it had to be mine! 100% cotton, Machine wash warm inside out, with like colors, Only non- chlorine bleach. Tumble dry medium. Do not iron. Do not dry clean. The shirt is a relaxed fit and is soft. I put this Tshirt through the washer/dryer/iron test and there was no shreading of the design. It came out perfect.